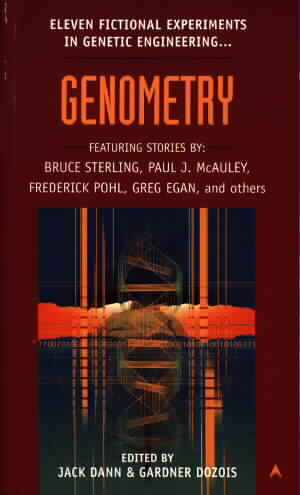 Genometry, edited by Gardner Dozois and Jack Dann. A book review by jpoc. One of a series of themed anthologies assembled by Dann and Dozois, this collection brings together ten stories written between 1984 and 1999 plus one tale from 1961. The stories are all related to the theme of directed biological mutations and they cover a range of topics from viruses designed to introduce new genetic material into humans to complete engineered ecosystems. Each story is introduced by the editors with a capsule biography and reading list for the story's author. Those notes are useful but if you read more than a couple of these collections you will start to see the same introductions cropping up as the editors tend to assemble about two thirds of the content from a group of a dozen or so writers. For me, the highlight of the book was the last and oldest story, Cordwainer Smith's "A Planet Named Shayol" which had the sort of ghastly desolation in its atmosphere that I normally associate with Harlan Ellison at his best. It tells about a group of criminals sent for eternity to a punishment planet where they are used to grow spare body parts for transplant surgery. Brian Stableford's "The Pipes of Pan" is another fine story dealing with immortality and the problem of people wanting children in a world where you cannot allow children to grow up because you would then have too many people. With other tales from the likes of Paul J.McAuley, Frederik Pohl, Greg Egan, John Brunner and Bruce Sterling, you can expect to find a lot of good things to read. I rate this as one of the better books in the series and recommend it to any fan of SF short stories. If you enjoy this book and hard SF stories in general, try to get hold of a copy of Nanotech and after that Space Soldiers and Future War in the same series. McAuley, Paul J.: "The Invisible Country"
Pohl, Frederik: "The Kindly Isle"
Gunn, Eileen: "Stable Strategies for Middle Management"
Brunner, John: "Good With Rice"
Dunn, J.R.: "The Other Shore"
Lawson, Chris: "Written in Blood"
Stableford, Brian: "The Pipes of Pan"
Smith, Cordwainer: "A Planet Named Shayol"